Senior Congress leader and lawyer Kapil Sibal earlier today told media persons that he indeed had bought a company and his transaction was legal. He was responding to questions put by journalists following OpIndia.com exclusive report over Kapil Sibal buying a company named Grande Castello. However, today’s statement by Kapil Sibal can be seen as a complete u-turn within a matter of two months, because in January this year he had given evasive and misleading answers about owning or being a director in Grande Castello to a South African investigative journalist named Craig McKune. Craig works with a South Africa based non-profit organisation named amaBhungane that undertakes investigative journalism. He had reached out to Sibal during his investigations about Gupta brothers – India born businessmen accused of being corruption partners of the then South African President Jacob Zuma. 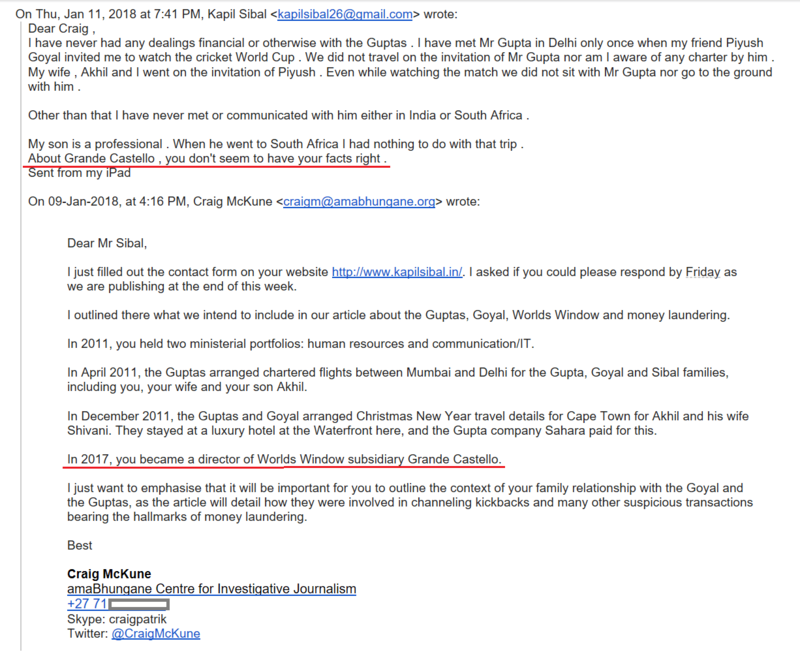 Craig discovered that in 2017, Kapil Sibal had become a director in Grande Castello, which was originally a subsidiary of Worlds Window, a company controlled by Piyoosh Goyal – a man who was suspected of laundering money with the Gupta brothers. So as one can see, on January 11, 2018 – when pointed out that he became a director in Grande Castello, Sibal says “you don’t seem to have your facts right”. Now today Sibal admits that he owns Grande Castello, so what was the reason to give such a misleading response to Craig just two months back? Why was he not forthright in admitting that he owned Grande Castello? Perhaps being a shrewd lawyer, Sibal was referring to Grande Castello no longer being a Worlds Window subsidiary (since he and his wife bought 100% of the shares, it was no longer a subsidiary of Worlds Window), which allowed him to claim that “you don’t seem to have your facts right”. So yet again, despite being given specific proof about Kapil Sibal being a director in Grande Castello, Sibal tells Craig that “I have never been a Director of any subsidiary company of any company”. Yet again, perhaps it was a verbal jugglery by Sibal because technically Grande Castello ceased to be a subsidiary company once it was acquired by Kapil Sibal and his wife, but the issue here is why could the Congress leader simply not say the same to Craig then, which he has now admitted in public? 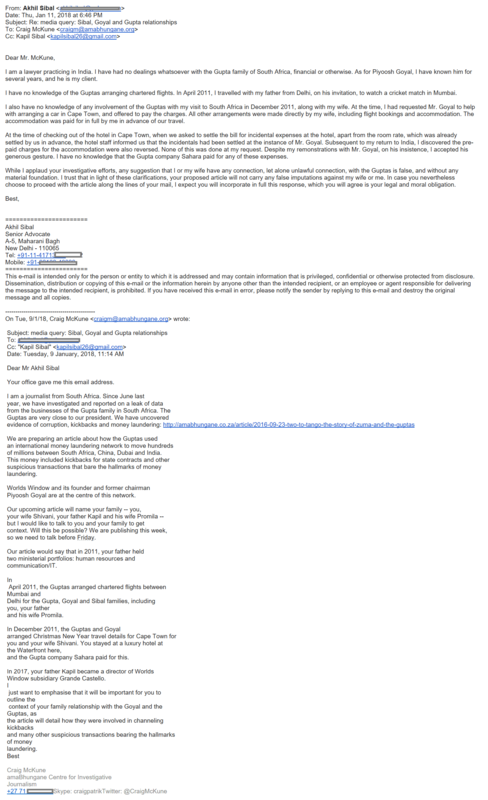 In fact, Craig sent yet another email on the same day i.e. on January 11, 2018, this time with documentary proof that Grande Castello was a Worlds Window subsidiary and that Kapil Sibal was a director in Grande Castello, and requested Sibal to clarify what he meant by facts being wrong. That mail was not responded to. 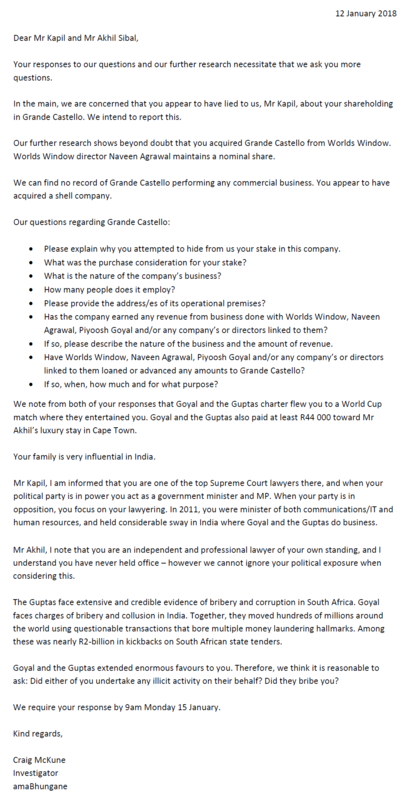 So yet again, Kapil Sibal refused to tell the South African journalist that he indeed owned Grande Castello and that he was a director in the company. Following which, amaBhungane published the story, and strangely no one in the Indian mainstream media picked it up. 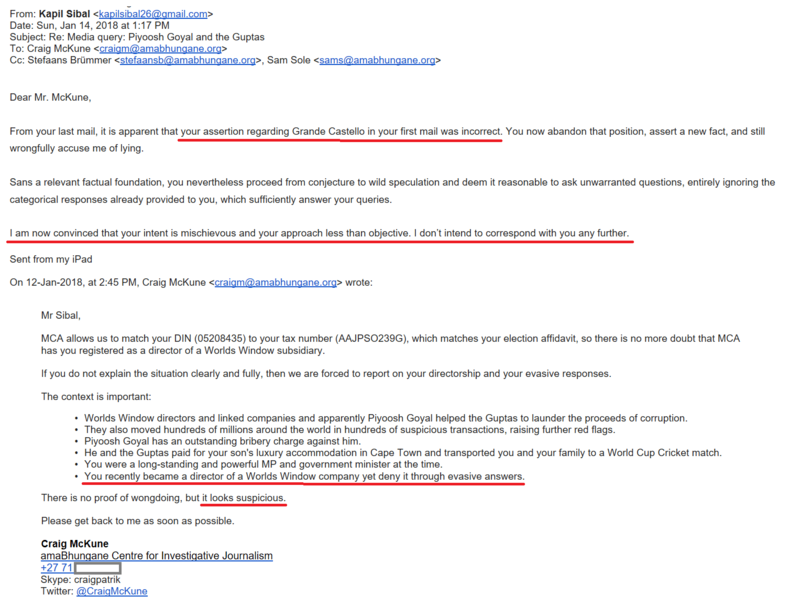 When OpIndia.com picked it up and published a story yesterday, Kapil Sibal threatened to sue us. This, when it’s clear that he was evasive in his reply to South African journalists and for some reason didn’t tell them that he indeed had bought Grande Castello – something he disclosed today. What was the reason for being evasive? Only Sibal can tell, but he clearly doesn’t like answering questions. Stefaans Brümmer of amaBhungane told OpIndia.com that he was glad that finally someone in India was following up the story, and along with his colleague Craig McKune, gave us the permission to carry these emails that show how Kapil Sibal was not forthright in his responses, and why OpIndia decided to raise the issue in India. We thank Stefaans and Craig for this cooperation, and we are also reproducing their email the exchange with Kapil Sibal’s son Akhil Sibal below as requested by them because they thought that it’s only fair that full information goes into the public and Kapil Sibal’s son is not unnecessarily dragged into the whole controversy.